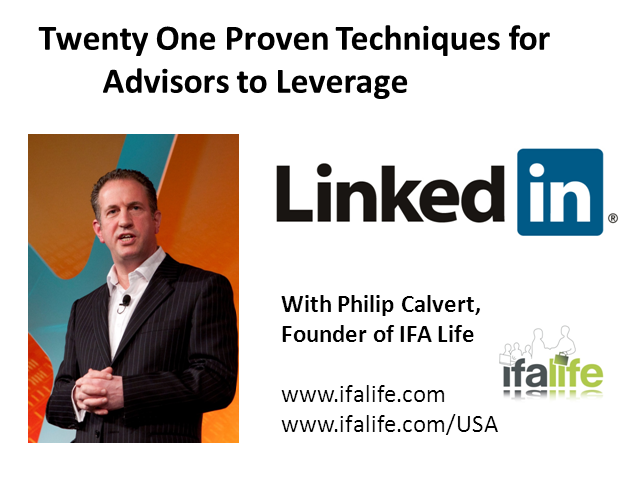 Philip Calvert's workshops on how to leverage LinkedIn have produced startling results for financial advisors, and in this special webcast, he will reveal both proven and little known techniques to enhance the profile and reputation of the financial advice community. Philip will also reveal his personal 'killer strategy' for leveraging LinkedIn and wider social media tools. If you're a financial advisor and are not seeing enough return from using LinkedIn, then don't miss this! Philip Calvert is a professional speaker on social media and the founder of IFA Life - the award-winning social networking site for financial advisors. He was recently voted as the Professional Adviser Magazine Personality of the Year in the UK and one of the Top 5 Tweeters about Money. He is recognized as one of the pioneers of the use of social media in Financial Services and speaks regularly at advisor conferences throughout the UK. He has also spoken in New York and on two occasions at the Asia Pacific Financial Planning Conference in Singapore.